Trust God Yet Consult with Others in our Strategic Planning? On one hand God tells us to consult with others in our planning and on the other hand we read that we’re to wholly trust Him. Sometimes we find what appears to be conflicting ideas in Scripture that we need to reconcile. Because the heart is deceitful due to our fallen human condition, we need God’s help in planning our next steps. His ways are always pure and best. Without God paving the way, our plans will not have the eternal impact we should be seeking. We must always submit to God’s sovereignty. We must guard against wasting our time and resources trying to push our own agendas rather than His. God designed the Church to function interdependently, exercising a mutual, reciprocity among members. If you haven’t already read this leadership basic, go to God’s Design for the Church: Body Life where you will find Scripture about God’s intent. Strategic planning certainly is not the time to go at it alone. We need to accomplish all of our tasks as leaders through the grid of the basics of life in Christ. Hence, we must consider how Body Life and strategic planning fit together in order to follow God’s design. We can’t deny God’s desire for us to get others involved in the planning process. Yet, we must reconcile how doing that congeals with wholeheartedly trusting the Lord. Won’t it appear as though we aren’t trusting God enough if we seek the input of others in the Body? The outcome of strategic planning isn’t merely to come up with a good plan but rather to get on page with God. Consequently, how and why we involve the Body in strategic planning makes the difference. 1) Make God an integral part of the process. Always pray before, during, and after getting input. God promised to give us wisdom if we ask (James 1:5). 2) Welcome different perspectives and ideas. God often uses our diversity to bring us closer to where He wants us to be than where we might arrive from our own single standpoint. It’s part of being “faithful stewards of God’s grace in its various forms” (1 Pet. 4:10). The intent of “strategic” planning is to arrive at the best course of action for the situation, not merely a plan. 3) Always submit to God. That begins with running all ideas through the filter of His Word and eliminating those that do not align with His ways and purposes (Heb. 5:14; Ps. 119:105). And, continue to pray and pray some more until you sense you truly are on page with God, doing His will. 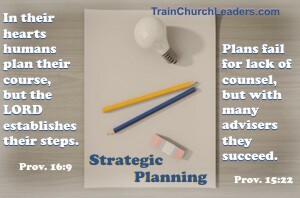 Strategic planning involves making the most of every opportunity which happens when we submit to God and His will. To get there we use the processes He has already established, part of which includes consulting with others.